Ukrainian police have used tear gas and stun grenades after pro-EU protesters began throwing Molotov cocktails at officers. 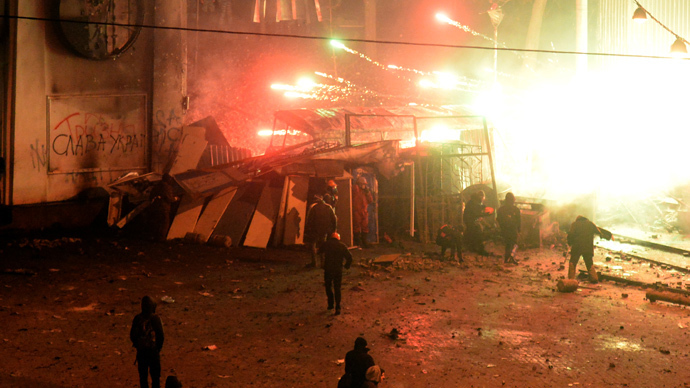 The clashes followed violence at the protests in the country’s capital, Kiev, on the previous day. 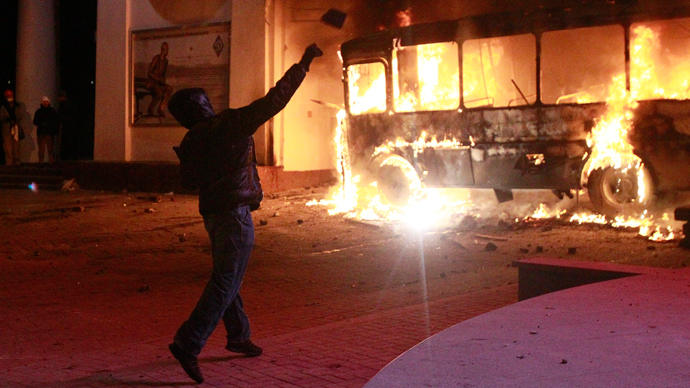 The protesters climbed atop the main gate of the Dynamo football stadium, using it as a strongpoint to bombard the police’s special forces with Molotov cocktails. 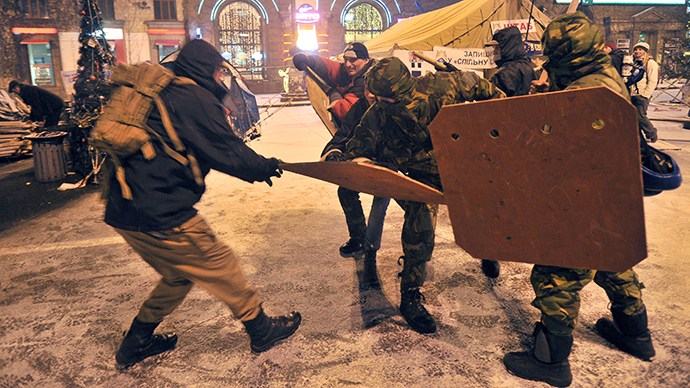 The officers, who were trying to prevent protesters from entering the governmental offices district, were forced to retreat, RIA Novosti news agency reports. Fire brigade teams have arrived at Kiev’s European Square to put out fires, burning riot police shields and officers’ uniforms. 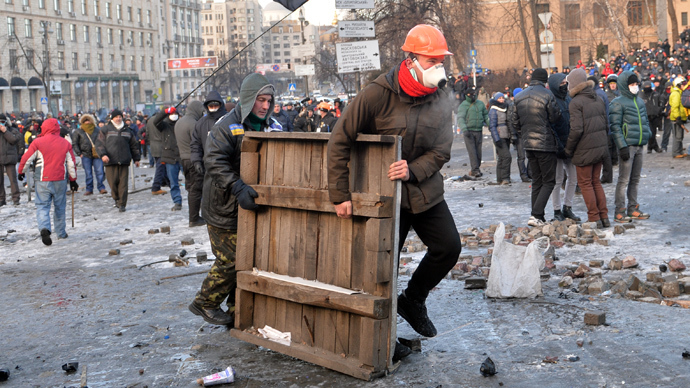 The demonstrators have delivered gasoline canisters and empty bottles to make more Molotov cocktails. The police opted for tear gas and stun grenades in order to contain the rioting crowd, which local media estimate at around 2,000. RT’s cameraman was caught in the stand-off as he got hit in the back with a rubber bullet fired by police, Aleksey Yaroshevsky reports. The cameraman was not injured. 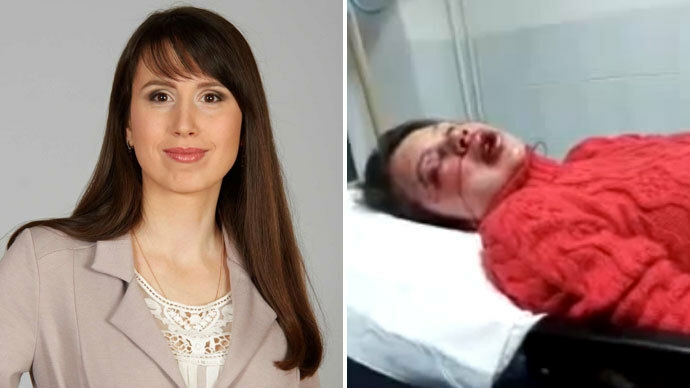 A cameraman of Ukraine's ICTV channel was hit with a bullet in the eye, however. Yaroshevsky reports that doctors say he might partially lose his sight. 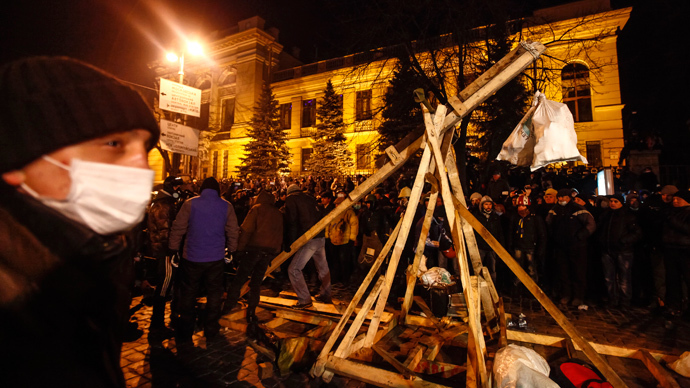 The protesters meanwhile built a wooden catapult on European Square. The 3-meter-tall ballistic device was put to use with a shot fired in the direction of the police. The projectile flew less than 10 meters, however, and no casualties were reported. The protesters and the police are separated from each other by a convoy of Interior Ministry vehicles, which were burnt by the protesters on Sunday, becoming a symbolic dividing line between the sides. 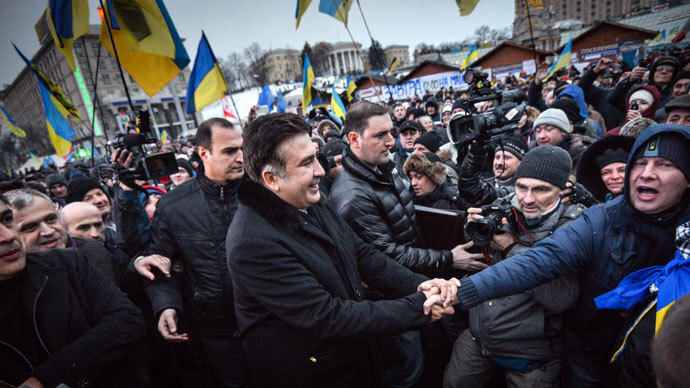 The Ukrainian president, Viktor Yanukovich, agreed to start dialogue with the opposition and ordered that a group of negotiators be formed from the government. But the leader himself reportedly has no plans of participating in the talks. On Monday evening, the representatives of government and opposition have held a meeting to try to finding a solution to the political crisis in Ukraine, Anna German from ruling Party of Regions told loval UNN news agency. More than 100 people sought medical assistance from doctors after the first day of violence on Sunday, with 61 police officers picking up injuries during the riot. Over 30 people were detained. The clashes in Kiev erupted after a massive rally held in Independence Square on Sunday, where protesters spoke out against the set of laws adopted by the Ukrainian government last week. The new legislation toughens responsibility for participation in mass protests, restricts access to Internet websites involved in distribution of illegal information and introduces criminal punishment for libel and defamation of war memorials. Ukrainian Foreign Ministry has urged the international community to condemn radical actions of the protesters, which led to massive clashes in the center of the country’s capital. The initially peaceful rally was marred by “radicals resorting to illegal actions, which required an appropriate law enforcement response,” the ministry said in a statement. The situation in Ukraine has been tense since November 21, when the authorities suspended preparations for the signing of an association agreement with the EU.